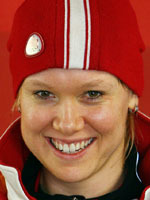 Cindy Klassen is undoubtedly Canada's greatest ever speed skater. Her haul of five Olympic medals at the Turin Games in 2006 was a first for a Canadian in Olympic history while her bronze from Salt Lake four years earlier makes her the most decorated athlete at either Summer or Winter Games from the North American nation. But she is now in a race against time to be back to her best for the Vancouver Games after a knee injury washed out her 2008-09 season. Born in Winnipeg, Manitoba but now a resident in the 1988 Winter Olympic host city of Calgary, Klassen is no one-trick pony. She took part in the 1999 Pan American Games in In-line speed skating, has turned out for the junior national ice-hockey team in 1996 and even played for Canada's lacrosse team when the sport was a demonstration event at the 1994 Commonwealth Games. In fact, she only turned her feet to speed skating after suffering the disappointment of being overlooked for Canada's 1998 Olympic ice-hockey squad. Her triumphs and records are certainly not bad going for a woman who initially turned her nose up at the sport saying she hated the skin-tight suits and thought the skates looked dumb. World junior champion over 1000m at 19, she was on the Olympic podium at Salt Lake in 2002, finishing third over 3000m while narrowly missing two further medals with fourth in both the 1500m and 5000m races. Between 2001 and 2007, the Canadian won no less than 16 world championship medals (4 gold, 6 silver, 6 bronze) and memorably became the first Canadian to win the overall world title in 2003 before repeating the feat in 2006. All this came after a horrific injury in 2004 when she crashed into another skater in training, tearing 12 tendons in her arm and picking up a 10cm laceration. When she smashed the 1500m and 3000m world records less than four months before the Turin Games, the signals were there that she would be a serious medal contender. But she exceeded all expectations with her historic feat of five medals, including gold in the 1500m, silver in the 1000m and team pursuit, plus a couple bronze medals in the 3000m and 5000m. Klassen won four world medals in 2007 but had to undergo a series of knee operations after wear and tear on damaged ligaments that dated back to a basketball injury as a teenager that was never properly treated. The surgery took place in the summer of 2008 but her fighting spirit and determination will ensure that she is back to her tenacious best when she targets more Olympic glory on home soil at Vancouver in February 2010.